Paiwan Leangsutjai was born in 1957. She graduated with a Bachelor’s Degree from Srinakharinwirot University in the Faculty of Humanities, a Bachelor of Education Program in Thai Language, and a Master’s Degree from Silpakorn University in the Faculty of Education and Educational Administration. 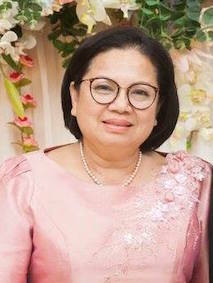 She developed Satri Wat Rakang School by using principles of Buddhism, democracy, and participation of the school and society for behavioral change of students. She organizes events on Buddhist Religious Observance Days, meditation camps emphasizing good moral virtues. She is an invited lecturer who teaches Dharma and has passed examinations confirming her as a Dharma Scholar. In 2013 – 2014, she got awarded, “100,000 of the Best Teachers.” Her project “Reduce Energy Consumption to Heal the World” was awarded by Her Royal Highness Princess Soamsavali. She organized a school bank for students to know how to save money, know the value of resources, and cultivate good habits. Paiwan Leangsutjai, is the Director of Satri Wat Rakang School and she uses good governance principles to manage the school and maximize benefits for the collective whole. She is widely known and accepted, is hard working and accepts responsibility and uses the Dharma, for example, hiri ottappa, or fear of doing wrong, to guide her success in work and life. Paiwan Leangsutjai is known for her patience and politeness; she practices the Four Divine Abidings: Loving-Kindness, Compassion, Sympathetic Joy and Equanimity.